California was once a well-known boat-building site where many river steamers were launched, and today it is reclaiming that history as a great place for residents and visitors alike to enjoy the waters of the Mon. The site is one of great natural beauty, with plenty of opportunities for boating, paddling, and fishing. Originally, the town was named for the settlers that were traveling to California during the great gold rush of the 1800s, but many travelers decided to stay in the area permanently to create their own little California of the east. Coal mining became the principal industry in the area after the railroad was built along the river. 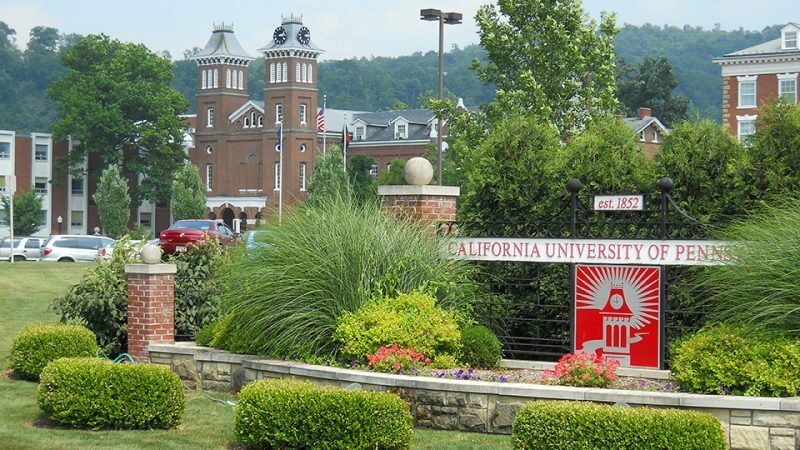 Since that time, the California University of Pennsylvania, founded in 1852, makes up a great portion of the town’s population and is a significant contributor to the economy. The California/Coal Center business directory offers restaurants, bars, retail, and other services. Click the button to the right to view the directory. In the heart of town is the California Public Library. It is actually housed in an old train station along the tracks with a genuine caboose displayed outside on the lawn. The train used to carry both passengers and baggage from Pittsburgh through California several times a day, but was vacated in the early 1950s until the California Public Library started renting it in 1958. A few blocks away from the library is the California Union Memorial Park. When you visit, it will not appear to be your typical cemetery. There are two 60-foot retaining walls plastered with old grave markers, instead of the stones being buried in the ground. One of California’s founders is buried here, as well as soldiers from the War of 1812 and the Civil War. If history interests you, you may want to check out the California Area Historical Society at the corner of Fifth and Wood Streets. The building itself is over one hundred years old and houses records on the history of Washington, Greene, and Fayette Counties, the Civil War regimental history, and local history. They even have some old yearbooks! Their mission is to preserve the history of the region and share it with the public. When you have the time, take a stroll around California University. They have an amazing Convocation Center at the far end of campus near the river, and hold several events there throughout the year. If you are staying in town late into the day or over night, check to see if any fun concerts or exhibits are going on there. The California Boat Club is actually located in the community of Coal Center, separated from California by Pike Run, a tributary to the Mon. The club is an old barge, retired and permanently docked along shore. Be sure to bring your camera when you visit this interesting site! You can park your boat at the Coal Center Public Docks and head up the bank to Lagerheads. This is a beautiful stretch of the river, and Lagerheads is an excellent restaurant and bar right next to the water that offers outdoor seating. While relaxing here, you may even get the chance to see a barge go by. Overlooking all of this is High Point, a restaurant and lounge located up on the top of the Mon River Valley that overlooks the river, the town, and the surrounding area. In the summer months, enjoy your food in their outdoor seating area to get an even better look at the view. 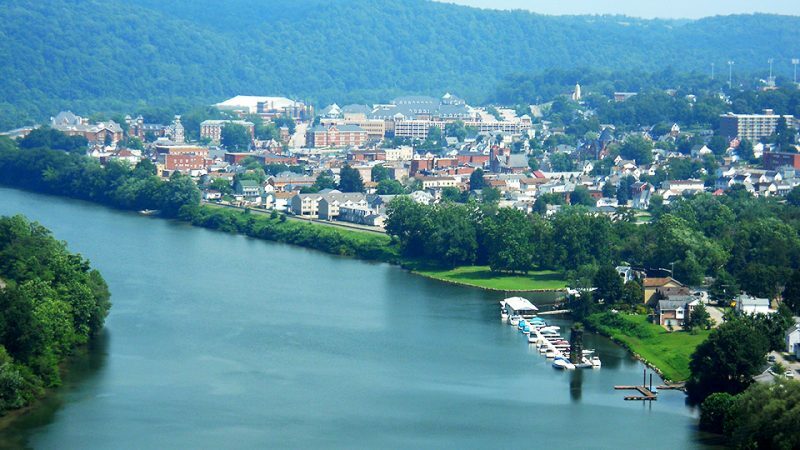 This section of the Monongehela River doesn’t carry any official water trail designation, but it has been scouted and a map and guide was created in 2013. Click here to download the map. Click here to download the guide. A public boat launch is located where Union Street goes under the railroad tracks, after the intersection with First Street. Free parking is available in the gravel lot just a block away behind the sewage plant. Limited street parking is also available on Union and First Streets. This is also a great put-in/take-out site if you are more interested in kayaks or canoeing. It is just a 4.5-mile paddle to Brownsville, the neighboring River Town, and makes a great day trip in which you can just float back down the river to California afterwards. The California Boat Club, in Coal Center, is a private club. Large and small motorboats are accepted at the club; you can call 724-938-9913 for more information. A few hundred yards away from the California Boat Club are public docks in front of the Coal Center Borough Building. They are conveniently located right in front of Dowler Park, which makes for a nice place to sit by the river. Overnight docking is not permitted, but local residents often use these docks for fishing and lounging down by the water. Local residents and visitors often use the public docks in Coal Center for fishing and enjoying the river. There is also an annual Fishing Festival each April at Pike Run and Rotary Park for yong anglers to have the chance to compete in catching the biggest trout. The event is free and brings people from the all over the area to the water to enjoy a fun day in the sun with their families. Interested in visiting California? Read our sample Itinerary, A Day in California, for ideas of what to see and do!